From routine checkups to treatments for surgery, Prince William Foot & Ankle Center, PC is equipped to handle all your podiatric needs. We have state of the art equipment to handle all your needs including an onsite DIGITAL X-RAY MACHINE/SCANNER, RADIAL SHOCKWAVE EQUIPMENT, and DIAGNOSTIC ULTRASOUND. To help you understand your options, we've included descriptions of some of our leading services on this page and instructions on the bottom of the page. 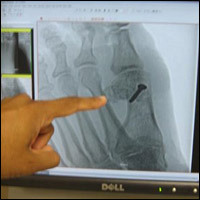 You can also visit our foot doctor page to better understand what it is we do.